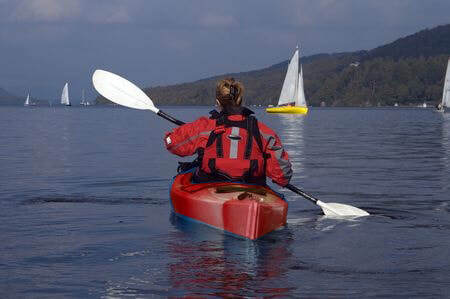 We have Kayaks and Canoes for your enjoyment. We have life jackets and water shoes that you may borrow. If you require an excellent fit, it is recommended that you bring your own gear. Lake Logan is Ohio's best fishing lake. Bring your poles. 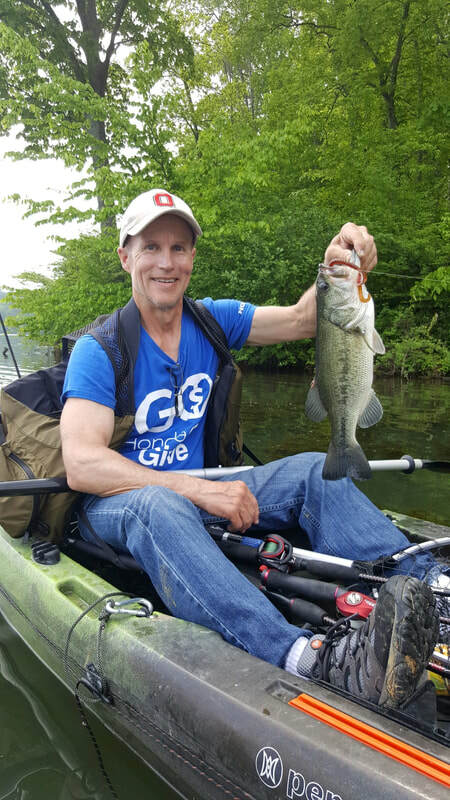 Great fishing right off of our private dock. ​​​State Dock, directly across the lake. 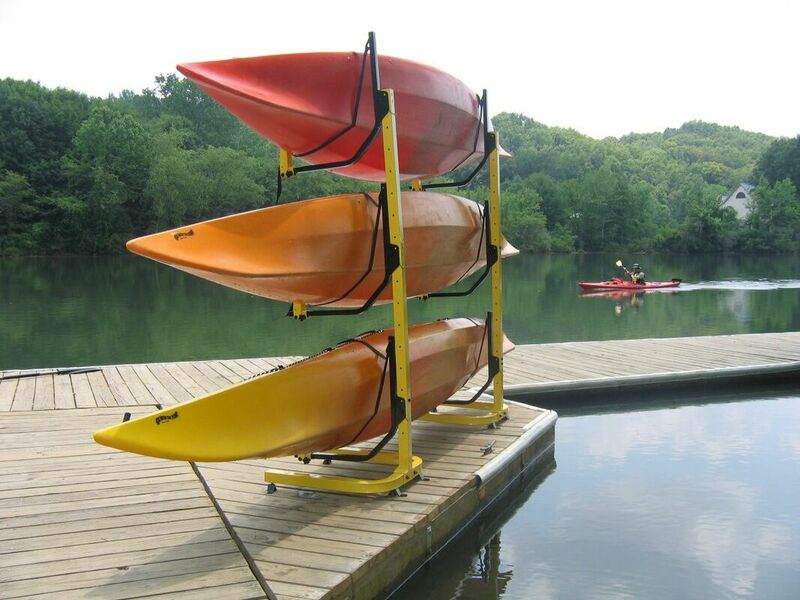 ​The lake sports northern pike, bass, bluegill, crappie, catfish and saugeye. Photo of Kyle Robinson with his "catch"
Miles and Miles of hiking paths. 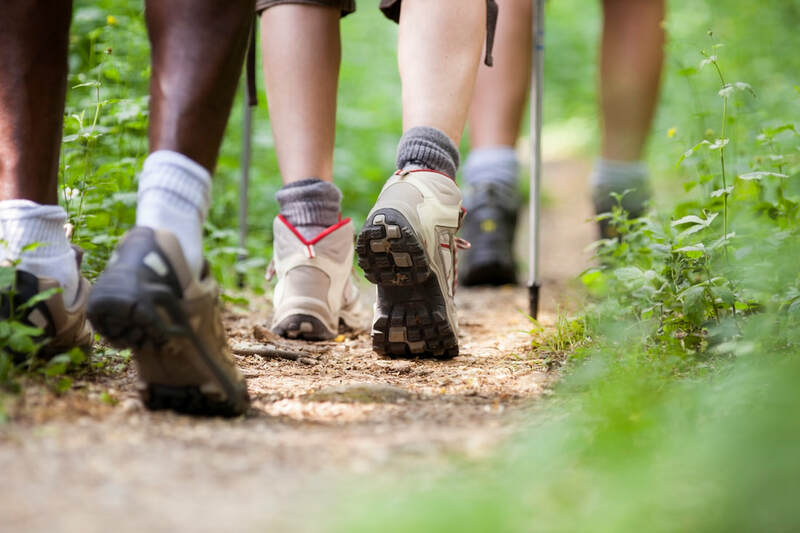 Short easy hikes and challenging hikes. ​Throughout most of history, humans have been inspired by the wondrous sight of a night sky filled with stars. Our stories and mythologies have been mapped upon the patterns of the stars. Our calendars, festivals, and agriculture have been linked to the movement of the heavens. In recent times, a view of the night sky has been the inspiration for many young people for a lifelong passion for science in general. Sadly, however, the lights of our modern world have, in recent decades, put our view of the heavens behind a veil of artificial light. Most of us live under a sky that gives only a pale, washed out a hint of its former beauty. An astronomy park in the Hocking Hills State Park was inspired by our vanishing night sky. 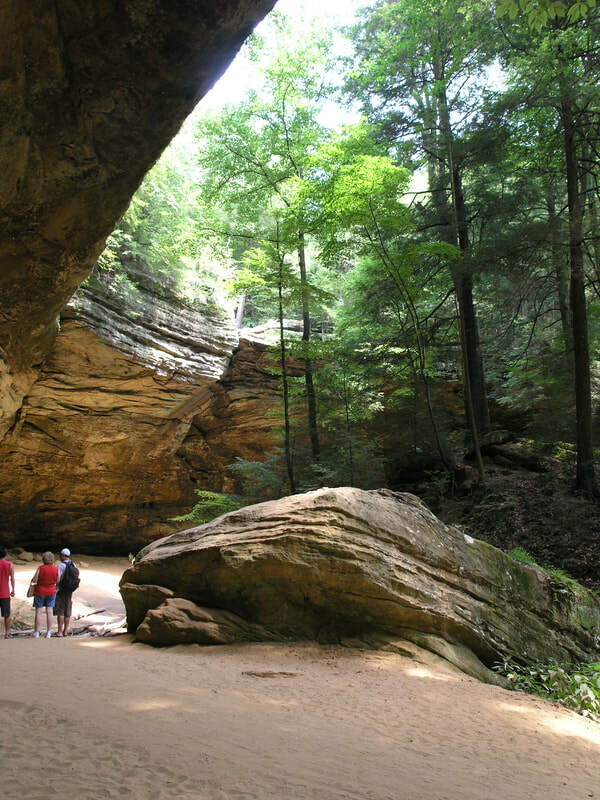 The Hocking Hills, in rural southeastern Ohio, is one of the few areas left in the state of Ohio where the night sky can be seen in its near pristine state. 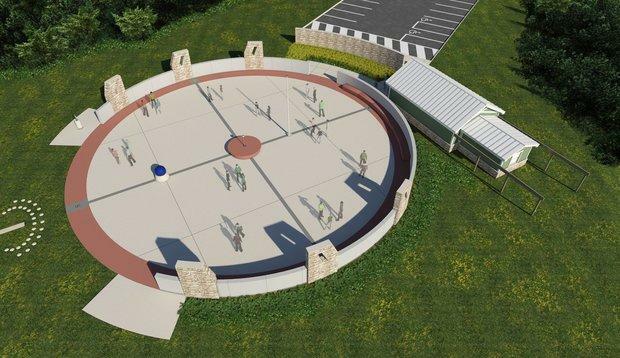 The observatory will provide a venue for visitors to the Hocking Hills State Park to experience the night sky through a large telescope and with their eyes. The observatory also draws on the countless generations of humans who marked the important changes of the seasons through the motion of the sun and who built great structures, like Stonehenge in England, the Chaco Canyon Kiva in New Mexico or many Hopewell and Fort Ancient Earthworks in Ohio, that commemorated these days. The plaza has been designed to allow the rays of the sun to fall upon a special central point on the first day of each of the four seasons. 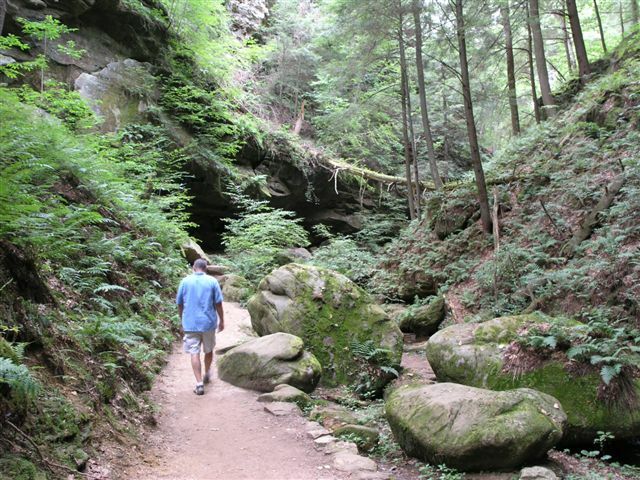 Tour the Hocking Hills cycling routes, offering about 4 miles of mountain bike trails. A two mile medium loop and two mile hard loop. 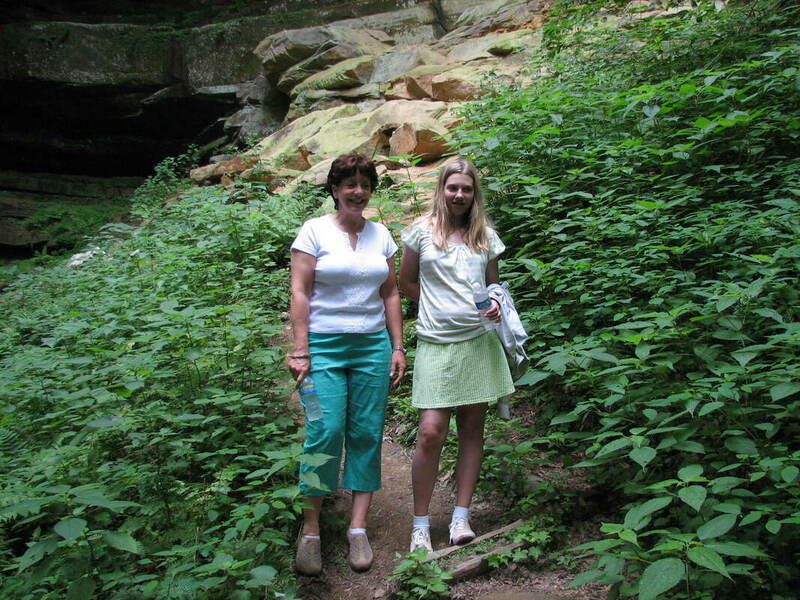 For more information on these Hocking Hills bike trails call (740) 385-8003. The Hockhocking Adena Bikeway is a 19-mile stretch from the East State Street Recreation area in Athens to Hocking College in Nelsonville. 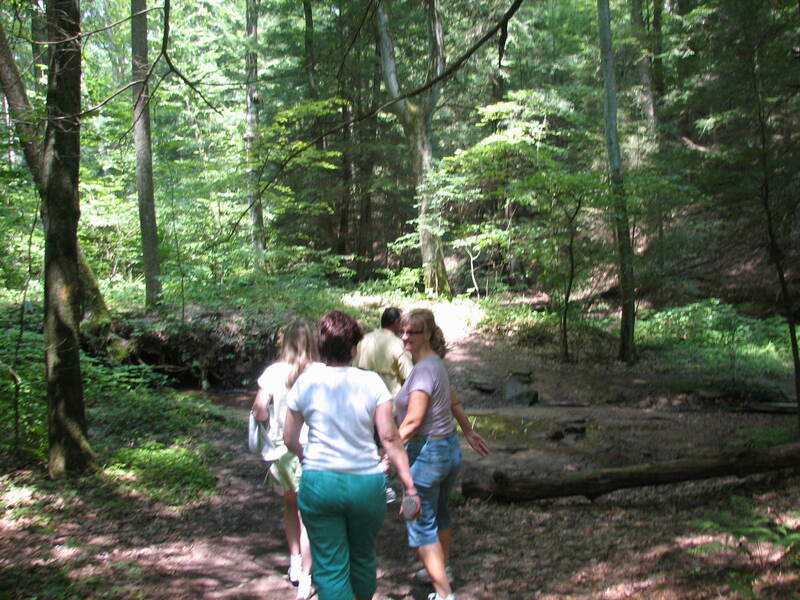 Completely paved and handicapped accessible, it is located on the old Columbus and Hocking Valley Railroad bed. Visit the Bikeway’s website for more information. Lake Hope’s 23-mile single-track bike trail was chosen as Ohio’s top mountain bike trail by readers of “Mountain Bike Magazine”. 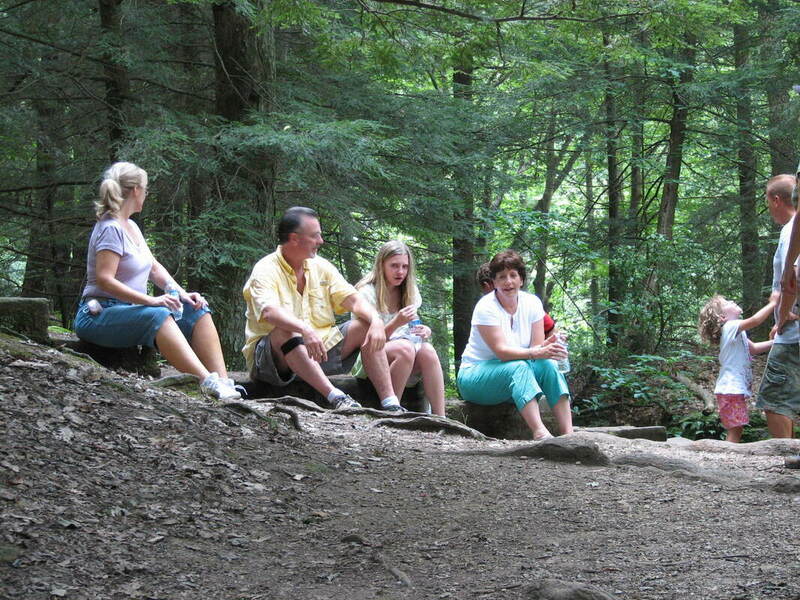 The wooded single-track, which is open to mountain bikes, offers plenty of bike riding options. 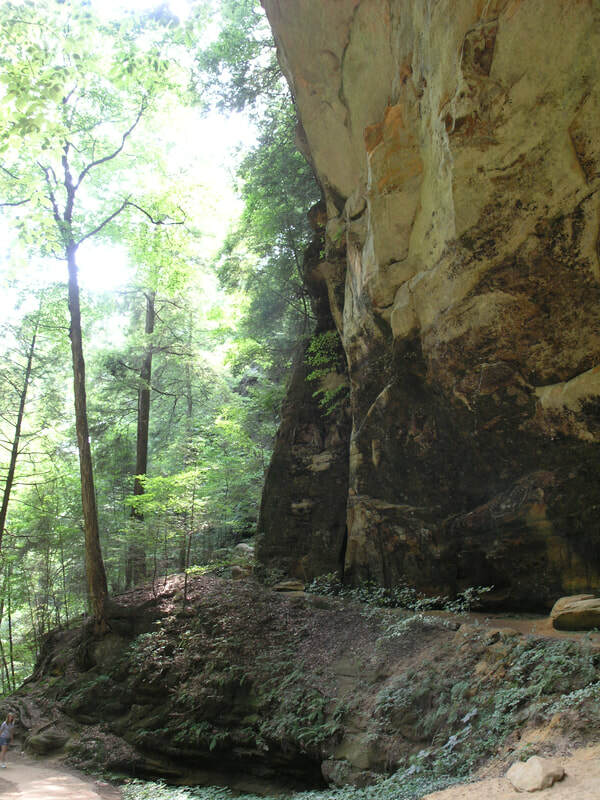 The Wayne National Forest Monday Creek area offers trails for mountain biking. Trail permits are required. 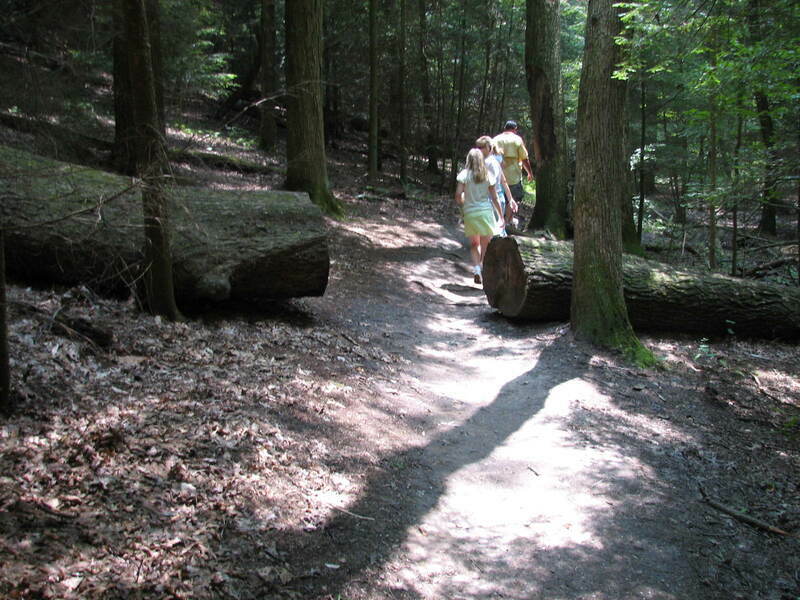 Please check Wayne National Forest’s web site for trail opening and permit information. 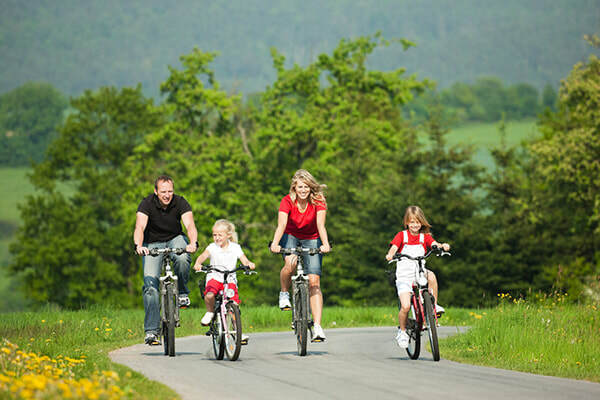 A few other bike trails are described below. The Wind At Your Back bike rental package is available. Leave: Hocking Hills Regional Welcome Center at State Route 664 and US 33. Lake Logan Road is across the highway from the Welcome center. What to Expect: This road is mostly on the north shore of Lake Logan, and passes the boat rentals, picnic areas, and the swimming beach. Climbing: You will climb about 1300 feet on this ride. One of the hills on Bremen Road is not only fairly long, but it gets continually steeper as you climb. Leave: Hocking County Fairgrounds. Go right from main gate to stop sign. Turn left. Turn right at first traffic light. Turn left on St. Rt. 312. Go straight through Bremen on St. Rt. 664 to Rushville. Turn left at traffic light. At edge of West Rushville, bear right on Coonpath Road. Turn left on Lake Road. In North Bremen, turn left on Bremen Rd. At stop sign, turn right on St. Rt. 664. Turn right on Rutter Hill Road where St. Rt. 312 makes a sharp 90 degree left turn. Rutter Hill Road turns into Bremen Road at the Hocking County line. At 93 turn right. At the first traffic light turn left. Turn right on Homer Street (first street). What to Expect: St. Rt. 312 passes through some Amish farm land. As you approach Bremen, the land is somewhat more rolling than hilly. Coonpath and Lake Roads go through prosperous farm land. Rutter Hill/Bremen Road goes through one of the most pleasant valleys in Hocking County with very little motorized traffic. This is a very nice ride for those looking for more miles and a little less climbing. Cautions: St. Rt. 93 and the mile of St. Rt. 664 from Bremen to St. Rt. 37 have fairly heavy motorized traffic. Climbing: You will climb a total of over 900 feet on this ride. One of the hills on Bremen Road is not only fairly long, but it gets continually steeper as you climb. Leave: Hocking County Fairgrounds. Go left from main gate to traffic light. Turn left. At about 2 miles turn left on Maysville-Williams Road. At St. Rt. 93, turn left. Turn right on St. Rt. 312. Turn left on Rutter Hill Road where St. Rt. 312 makes a sharp 90 degree right turn. Rutter Hill Road turns into Bremen Road at the Hocking County line. At 93 turn right. At the first traffic light turn left. Turn right on Home Street (first street). Options: Continuing for a couple of miles on St. Rt. 312 past Rutter Hill Road will take you to the scenic town of Bremen. We’d strongly suggest that you double back to Rutter Hill Road. You’ll pass St. Rt. 664, which looks like a shortcut. Don’t take it unless you are really into major hill climbing. What to Expect: Maysville-Williams Road has mostly gentle hills up out of a pleasant valley into more rural hills. St. Rt. 312 passes through some Amish farm land. Bremen Road goes through one of the most pleasant valleys in Hocking County with very little motorized traffic. Both of these roads offer great, long down-hills. Cautions: Chieftain Drive and St. Rt. 93 have moderate motorized traffic. Climbing: You will climb a total of 800 feet to Laurelville, another 400 feet on our suggested return route. Leave: Hocking Hills Regional Welcome Center. Take Lake Logan Road to St. Rt. 180. Turn left onto St. Rt. 180, headed south. At the top of a very long, but gradual hill, take St. Rt. 678 through Gibisonville to St. Rt. 374. Turn right. Turn left on Thompson Ridge Road (at triangle intersection). From Laurelville, take St. Rt. 56 East to Big Pine Road (at Haynes). Take Big Pine Road to St. Rt. 664. Turn left. Where St. Rt. 664 makes a sharp 90 degree left turn, turn left onto Sauerkraut Road. At St. Rt. 93, turn left to Logan. Turn left on Main Street (the business section) or Hunter Street and ride west through Logan to St. Rt. 664. Turn left on St. Rt. 664 to return to the Welcome Center. 1. Just after you turn onto St. Rt. 180, turn left onto Pleasant Valley Road. Turn right on Star Route, right on Kreshbaum, then right on St. Rt. 180 to Gibisonville. This is a lovely ride, but adds a very major hill. 2. When you get on St. Rt. 664, you can follow it all the way back to the Welcome Center. This will shorten the ride a few miles, but adds a fairly major hill (at the end of the ride!) and has very heavy motorized traffic. What to Expect: This is one of our club’s favorite longer rides. The vistas from Thompson Ridge Road are awesome and Big Pine Road winds through a very scenic valley that passes Conkle’s Hollow and the Hocking State Forest. Cautions: Watch traffic on Lake Logan Road, St. Rt. 664, and St. Rt. 93. Be careful of turns on down hills. Leave: Conkle’s Hollow State Park (Intersection of St. Rt. 374 and Big Pine Road). You can ride as far as you’d like in either direction. To the left (North) is more shady and primitive. To the right (South) the valley opens up some into scenic farm vistas. What to Expect: This road has very little motorized traffic. 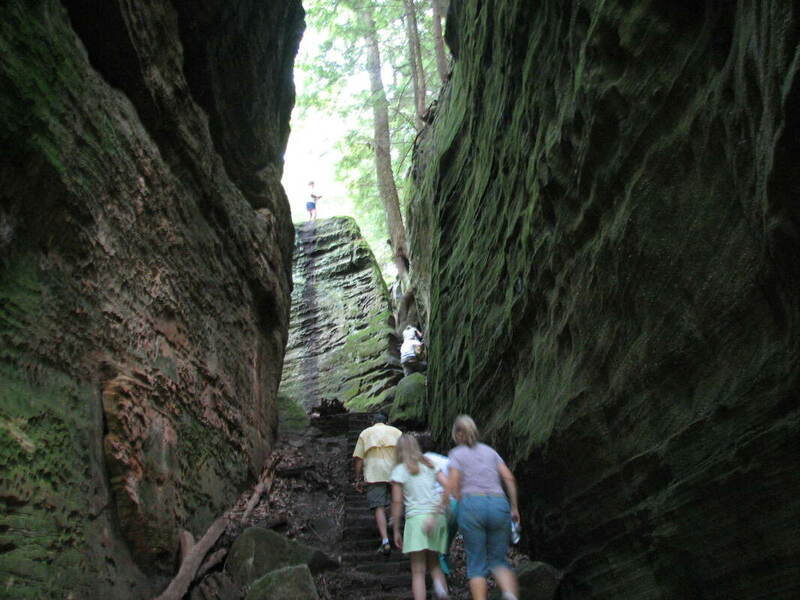 It winds through a very scenic valley that passes Conkle’s Hollow. Cautions: Traffic can be somewhat heavier during peak tourist times. Leave: Hocking Hills Regional Welcome Center. Take Lake Logan Road to St. Rt. 180. Immediately turn left on Pleasant Valley Road. Turn up Starr Route Hill (a very sharp left turn at the first stop sign). At St. Rt. 664, (the first stop sign on Starr Route) turn right. At a very sharp 90 degree turn, go straight onto Sauerkraut Road. At St. Rt. 93, turn left to Logan. Turn left on Main Street (the business section) or Hunter Street and ride west on St. Rt. 664 S. Turn left to get back to the Welcome Center. What to Expect: Passes the north shore of Lake Logan, then through scenic Pleasant Valley. There is a vigorous climb to scenic vistas on Starr Route. Option: At the intersection of Starr Route and St. Rt. 664 there is a road to the left (Blosser) that will take you to the south shore of Lake Logan. This road dead-ends at a small picnic facility with primitive restrooms. Cautions: Watch for traffic on St. Rt. 664, St. Rt. 93 and in Logan. Climbing: You will climb a total of 600 feet on this ride. One hill on Moore Road and one on Goat Run-Honeyfork Road are fairly challenging. Leave: Hocking County Fairgrounds. Turn left at the main gate, and right at Second Street (second intersection). Turn left at the first traffic light. After you cross the St. Rt. 33 overpass, stay in the left turn lane and turn up Walhonding Ave. This turns into Nickel Plate Road as you go up the hill out of town. Turn right at the first stop sign (St. Rt. 328). At the store in Union Furnace, turn right on Moore Road. Turn right on Goat Run-Honeyfork Road. Turn right on US 93. Turn right at the first traffic light (Front Street). Turn left at the second traffic light (Homer Ave.). What to Expect: This route takes you through hilly farm land. By most standards it’s a very pretty ride. Cautions: Watch for a very sharp curve at the bottom of Moore Road going down-hill. St. Rt. 328 and St. Rt. 93 have more motorized traffic.